These forest-dwelling elephants are smaller and darker than their savanna relatives and have smaller and characteristically rounded ears (2). The upper lip and nose are elongated into a trunk that is more hairy than that of the savanna elephants' (6). The trunk serves multiple functions, from acting as a dextrous 5th limb to a sound producer and amplifier, and an important method of touch between individuals (7). The trunk of the African species ends in two opposing processes (or lips), which differs from that of the Asian elephant (Elephas maximus), whose trunk ends in a single process (6). The other characteristic elephant feature, the modified upper incisors known as tusks, are generally almost straight and downwardly pointing in the forest elephant, rather than curving forward as they are in the savannah species (2). They are also a more yellow or brownish colour (6); these strong tusks are used to push through the dense undergrowth of their habitat (8). Bull elephants (mature males) are sometimes known to have exceptionally long tusks that reach almost to the ground (2). The more elusive forest elephant has not been studied as extensively as the savanna species but some striking differences in social organisation and behaviour are already apparent. These elephants occur in small groups of around 5 - 8 individuals (8), which sometimes come together to form larger 'bond groups' (9). Congregations also occur in swampy forest clearings known as 'bais' (9), where forest elephants usually go looking for minerals (10). Nevertheless, neither of these are anywhere near the size of herds recorded on the African plains (9). Like savanna elephants, however, sound is an important method of communication and forest elephants use low frequency infrasound rumblings that are below the range of human hearing (11). Elephants feed by plucking at grasses and leaves with their trunks, and the diet of the forest elephant is dependent on season (9). During the dry season, they mainly browse on grasses and leaves but in the wet, fruit is preferentially eaten (9). These elephants have a number of highly specialised relationships with forest plant species and there are a number of hard-shelled fruits such as those of the Makore tree that can only be opened and broken down by elephants (8); some fruits are broken by the dextrous use of tusks to pierce the hard outer coat. The forest elephant is confined to the dense forests of west and central equatorial Africa, particularly in the Congo basin (8). Mainly inhabits lowland tropical rainforest (2). Classified as Vulnerable (VU A2a) on the IUCN Red List 2004 (1), listed on Appendix II of CITES (3) and Appendix II of the Convention on Migratory Species (CMS or Bonn Convention) (4). 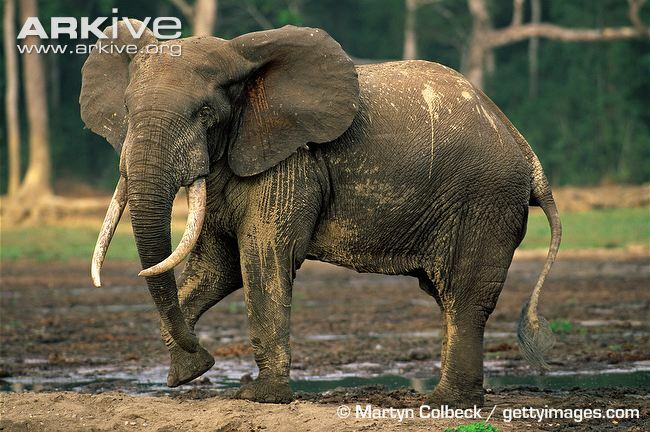 The forest elephant is listed under these as a subspecies of the African elephant (Loxodonta africana). Although preliminary genetic evidence published in 2001 suggests that the African elephant may constitute two distinct species, namely the savanna elephant (Loxodonta africana) and the forest elephant (Loxodonta cyclotis) (1), many conservationists believe there is as yet insufficient evidence to justify this distinction (5), and that premature allocation into more than one species may leave hybrids in an uncertain conservation status (1). For this reason, the Red List assessment is for the single species, encompassing both forest and savanna populations (1). As such, the Red List status for the forest elephant as a separate species is unknown. Logging in the Central African forest is one of the major threats facing the African forest elephant (8). Although selective logging, the more prevalent form of wood extraction in Central Africa, may actually benefit forest elephants by creating more of their preferred habitat – secondary forest - the construction of roads often associated with logging operations may have a detrimental effect by making these elephants more accessible to poachers and the bushmeat and ivory trade (8). The tusks of this species are more highly prized than that of either the Asian (Elephas maximus) or savanna elephant, as the ivory is harder whilst retaining its elastic properties (9). Other threats include habitat loss through the conversion of land to agriculture and increasing competition for resources with growing human populations (12). A ban on the international trade in elephant products including ivory was implemented in 1990, when the African elephant was added to Appendix I of the Convention on International Trade in Endangered Species (CITES) (3). The logistics of policing ivory poaching in the rainforest, however, are difficult to tackle (13). Beyond the controversy surrounding the taxonomic status of African elephants, there is a clear need for strategies aimed specifically at the forest elephant, to deal with unique factors brought about by its different habitat and largely unknown population sizes (13). To this end, the African Elephant Specialist Group (AfESG) has facilitated the development of a regional strategy for the conservation of elephants in Central Africa (14). This is an encouraging step in helping to secure the future of this elusive and largely forgotten elephant. Sounds that are below the range of human hearing. A different race of a species, which is geographically separated from other populations of that species. Spinage, C. (1994) Elephants. T. & A. D. Poyser Ltd, London. Burnie, D. (2001) Animal. Dorling Kindersley, London. Groning, K. and Saller, M. (1999) Elephants: a Cultural and Natural History. Koneman, Cologne. Eltringham, S.K. (1997) The Illustrated Encyclopedia of Elephants. Salamander Books Ltd, London. Blake, S. and Inkamba-Nkulu, C. (2004) Fruit, Minerals, and Forest Elephant Trails: Do All Roads Lead to Rome?. Biotropica, 36(3): 392 - 401. Blanc, J. (2006) Pers. comm. Stand Up For Ugly Animals! Wildscreen Arkive is a Wildscreen initiative. UK charity no. 299450 | USA 501(c)(3) nonprofit organization.